There are many fun activities to due during the winter when the temperatures drop and snow covers the ground. Sledding (on a duct take sled!) is one option, but you may not have hills in your area. This means another option will be needed. Ice skating or a game of hockey can be played on a frozen pond if one is available. 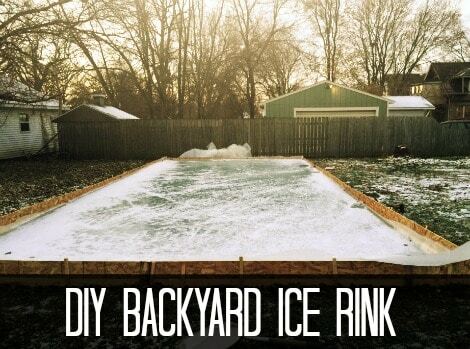 You also might find making DIY backyard ice rink to be even better. A DIY backyard ice rink will require a bit of planning before starting the project. The reason is you are likely to run into problems if you do not plan ahead first. This includes determining the place where you will want to build the ice rink and the size that is required. A tape measure is the best tool for this purpose. A frame will need to be constructed for your DIY backyard ice rink. Wood is the best material to make a suitable frame as it will be easy to work with and secure. This will mean you will need measurements that are accurate to cut the wood to the required size. The wood to use to build a DIY backyard ice rink can be found at any home improvement store. You need to make sure your DIY backyard ice rink is level. This means placing the rink in an area with the most level ground. The water that will freeze into the ice for the rink will self level, but you need to make sure the frame is built correctly. You do not want any sloping in your DIY backyard ice rink. The top of your ice rink is frozen water that will sit on top of a liner. A liner is needed as you do not want any water to soak into the ground.